Old Cobbler's Cottage01377 217523work01377 217754fax Self-cateringA characterful mid-19th century, terraced, oak beamed cottage situated overlooking the picturesque pond in the attractive village of North Dalton, nestling in the heart of the Yorkshire Wolds in Hockney country, just down the road from the location of some of his most famous paintings includng the Warter trees (in the next village). The village is a short drive from Driffield and Pocklington and the historic market town of Beverley, and only 20 miles from York and the East coast where Bridlington and Scarborough give visitors a wonderful seaside resort experience. The Heritage Coast found there includes the spectacular seabird reserve of Bempton Cliffs. For shopping and entertainment the historic and contrasting cities of York and Hull are both within a 40 minute drive with a host of museums, art galleries, theatres, cinemas, eating places and Hull's submarium, ''The Deep'' - the World's largest. The stately homes of Burton Agnes Hall, Sledmere House and Castle Howard are all a short drive from North Dalton and Beverley and York racecourses are easily accessible as are the North York Moors. Dogs accepted in pub next door. Latest News.......the close-by Pipe & Glass pub in neighbouring South Dalton (only 7.6 miles away and 21 minutes by car) , has just been voted the "Pub of the Year " in the Michelin Eating Out Pubs Guide 2012. It already has a Michelin star (awarded in 2010). The guide's editor said the pub offered something extra special including "the warmth of the welcome, the friendliness of the staff, the character of the place and refined yet hearty food" Worth a visit! The cottage is comfortably laid out with the front rooms overlooking the village pond and 11th century village church. A conservatory leads into a small, well-maintained rear garden with room for outdoor dining and lounging. The cottage is only 2 minutes walk from a friendly local pub serving excellent bar meals. Dogs are accepted in the pub. The cottage comprises: Double bedroom; Single bedroom; Dining room to seat 4; Lounge with settee, entertainment systems; Fully-equipped kitchen; Downstairs toilet & shower room. 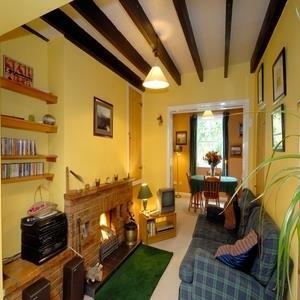 The cottage is fitted with electric central heating throughout. All bedding, towels, crockery and cutlery and a limited supply of coal for the fire are provided within the hire charge. Parking space for one car is provided (and extra space is available on request). Pets are welcome subject to notification. A payphone is available within the property. •	It has free parking for one car at the entrance to the cottage garden. Parking for 2 cars is available subject to notifying the owner in advance. •	A local bus service runs through the village, serving – York, Bridlington, Pocklington and Driffield, with bus and rail links to Beverley and Scarborough. •	The nearest medium sized towns are Driffield and Pocklington – between 6 – 8 miles away. •	The cottage has a BT telephone call box. Mobile phone reception is limited for some service providers. O2 has the best coverage. A characterful mid-19th century, terraced, oak beamed cottage situated overlooking the picturesque pond in the attractive village of North Dalton, nestling in the heart of the Yorkshire Wolds in Hockney country, just down the road from the location of some of his most famous paintings includng the Warter trees (in the next village). The village is a short drive from Driffield and Pocklington and the historic market town of Beverley, and only 20 miles from York and the East coast where Bridlington and Scarborough give visitors a wonderful seaside resort experience. The Heritage Coast found there includes the spectacular seabird reserve of Bempton Cliffs. Golf close by. Excellent area for walking. The Minster Way long distance footpath passes through the village and the wolds way is close by. The coast with seaside resort of Bridlington is a 30 minute drive away. Beverley races are also close by. Several historic houses nearby. Dogs accepted in pub Children welcome from any age. Old Cobbler's Cottage offers weekly bookings starting on Friday and short breaks of 4 days starting on any day. One Z bed available for one extra person. 2 bedrooms, dining room, kitchen/living room, shower room, conservatory, garden and parking. All electricity, heating, bed, linen, towels and coal are free as well as the pets stay. Sleeps offers weekly bookings starting on Friday and short breaks of 4 days starting on any day. Village is situated on the B1246 between Pocklington and Bainton. On entering North Dalton, take the narrow lane up the side of the village pub (The Star) car park. The cottage is the second mid-terraced cottage in the row on your left. Bus from Driffield Station take 744 or 143 towards Pocklington/York. Get off bus at the Star Inn, near Dalton.